Coloured sand in 3 different sizes for the perfect foundation of any base. Can also be painted any colour to resemble any climate or setting. The Xenos are appearing as if out of air. Arm yourself and get ready to fight for the survival of humankind! Enhance your experience of playing Zombicide: Invader by playing with painted miniatures. This paint set contains unique and new Warpaints needed to paint your Xenos and your Survivors, humankind's last defenders - plus a freebrush to get you started. Use The Army Painter Technique to get all of your miniatures game-ready in no time. Go to www.TheArmyPainter.com to learn more about the technique and get great tips to GET MORE TIME FOR GAMING! 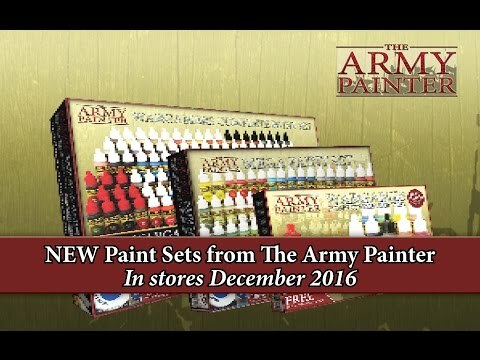 The Hobby Set has everything a wargamer and painter could want - all in one box. From assembling to painting this set can do it all. With The Army Painter tools, glue, paints and brushes - including a basecoat primer, you need look no further to get started with the exciting hobby of assembling and painting miniatures for both boardgames and wargames. Veteran or beginner alike - this high quality, high value set offers fantastic products to an unparalleled price, making it the best beginner hobby set in the industry. Use to create great effects of taller and wild grass. Can be used all over the base or in smaller clumps. - 6 x 12 ML BOTTLES WITH A CUT-OUT LABEL TO SEE YOUR COLOUR! Use Summer Undergrowth to resemble shrubberies or bushes. Great for wild looking bases such as jungle or forest. - PERFECT FOR WARPAINTS BOTTLE! It came from the swamp! A very realistic look and very good to combine this tuft with others for great effects. Made from stainless steel with a safety grip handle, the Precision Side Cutter is perfect for cutting metal miniatures or large bits of resin. Ideal for small cuts like arms, heads or weapons. Use to imitate cuts and battlefield damage on larger miniatures. - PERFECT FOR METAL AND RESIN MINIATURES! Winter is coming, and with the Winter Tuft so are your troops. Combine with Battlefield Snow for the perfect arctic base. The Frozen Tuft is perfect for decorating your frozen tundra, icy plains or other chilly environment. Combine with Battlefield Snow for perfection. Wasteland Tufts give the sinister impression of a harsh environment and are great for an “evil” setting for your army. Bright green and full of imaginary mosquitoes, this tuft closely mimics the jungle or spring grass early in the season. Razed by fire and war, the Scorched Tufts stand devoid of life on the battlefield. Distant moons or undead kingdoms, the Deadland Tuft allows you recreate the chilling atmosphere of death. - 3 X BATTERIES INCLUDED! - NO ARGUMENTS WHEN PLAYING! No more “seeing around the corner” or avoiding difficult terrain - Targetlock Laser Line is a fantastic aid for all types of wargaming. Also used for various phychic powers and spell effects!